Tripura is one of the seven states in the north eastern part of India located between 22 degree and 56 minutes and 24 degree and 32 minutes north latitude and between 90 degree and 09 minutes and 92 degree and 20 minutes. east latitude. It is bounded on the north, west, south and south-east by Bangladesh whereas in the east it has a common boundary with Assam and Mizoram. There is a common belief that the name of the State has originated from "Tripura Sundari" - the presiding deity of the land which is famous as one of the 51 pethos of Hindu Pilgrims. Apart from this traditional view, it is believed that originally the land was known as "Tuipra" meaning a land adjoining the water. It is fact that in days of yore the boundaries of Tripura were extended up to the Bay of Bengal when its rulers held sway from Garo hills to Arakan. The history of Tripura as an administrative unit dates back to the days of Maharajas when the territory was a native State. It is significant to note that all though Tripura was conquered by force of arms in 1761, no Political agents was appointed in the State till 1871 - a gap of 110 years.The former princely state of Tripura was ruled by Maharajas of Manikya dynasty. It was an independent administrative unit under the Maharaja even during the British rule in India though this independence was qualified, being subject to the recognition of the British, as the paramount power, of each successive ruler. After independence of India, an agreement of merger of Tripura with the Indian Union was signed by the Regent Maharani on September 9, 1947 and the administration of the state was actually taken over by the Govt. of India on October 15, 1949. 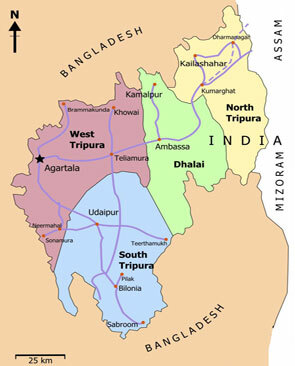 Tripura became a Union Territory without legislature with effect from November 1, 1956 and a popular ministry was installed in Tripura on July 1, 1963. On January 21, 1972 Tripura attained statehood. Location Remotest in the North East Region, 22o 56' ; 24o 32' North and 91o 09' and 92o 20' East. Land Total area 10.492 Sq. Km., International Border with Bangladesh-856 Km, Border with Mizoram-109 Km and with Assam-53 Km. Average size of Holding 0.56 Hectare. Irrigation 42% of Net Cropped area. Major Language Bengali, Kakborak and English. Economy The economy is primarily agrarian. The primary sector (Agricultural) contributes about 64% of total employment in the state and about 23% of the State Domestic Product (SDP). A variety of Horticultural/ Plantation Crops are produced in Tripura like Pineapple, Orange, Cashew nut, Jackfruit, Coconut, Tea, Rubber, Forest , Plantations etc. There is ample scope for increasing the area under such plantations as well as the productivity.